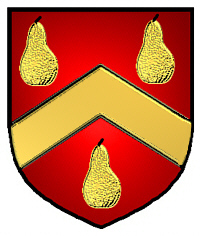 Coat of Arms: On a red shield, a chevron between three golden pears. Motto Translated: A friend to God and my country. Spelling variations include: Abbott, Abbot, Abbotts, Abbett, Abbet, Abott and others. First found in the counties of Oxfordshire, Huntingdon, Bedfordshire and Cambridge from very ancient times, before the Norman Conquest of England by Duke William of Normandy in 1066 A.D. Some of the first settlers of this name or some of its variants were: George Abbot of Andover Massachusetts born in Yorkshire died at Andover in 1681. George Abbott emigrated with his three sons and settled in Rowley Massachusetts in 1630. Arthur Abbott settled in Marblehead but removed to Ipswich Mass. and joined Winthrop in 1634 in the settlement of that town. Francis Abott settled in New York State in 1853. The early migration of the family is covered in the Abbott genealogy written in 1847. English and Scottish: from Middle English abbott ‘abbot’ (Old English abbod) or Old French abet ‘priest’. Both the Old English and the Old French term are derived from Late Latin abbas ‘priest’ (genitive abbatis), from Greek abbas, from Aramaic aba ‘father’. This was an occupational name for someone employed in the household of, or on the lands of, an abbot, and perhaps also a nickname for a sanctimonious person thought to resemble an abbot. In the U.S. this name is also sometimes a translation of a cognate or equivalent European name, e.g. Italian Abate, Spanish Abad, or German.